In Patch 1.5, we got two more quickbars and free respecs if you are a subscriber. This has been really fun to experiment with, and I think that it revolutionizes the way PvP is done. I started leveling a Sage, and one of the first things I bought out of the Legacy perks was the Field Respec. This allows you to respec anywhere at any time. This combined with the free respecs has allowed me to change from leveling DPS to Flashpoint healer to PvP DPS on the attacking phase on Voidstar to PvP healer on the defending phase on Voidstar. It really opens up the possibilities, and with the extra quickbars, I can have preset setups of my non-spec-specific skills to move the spec-skills into. I always have four bars up on my screen, with my main bar and my consumables bar underneath it in the bottom middle of my screen. I respec, move the spec-skills off of my main bar onto the consumable bar (since it has several empty spots), then I hit my keybind to make my main bar into either my Flashpoint heals bar (bar 5) or my PvP heals bar (bar 6). I then move the skills back into position, and within 30 seconds, I have a new spec and a new bar. It really is interesting how much of an advantage that is. Recently, with the addition of HK-51 in Patch 1.5, there have been multiple complaints of ganking in the Outlaw’s Den, as there is a vendor there with one of the required parts. I am not going to say a lot about it, except this: if you want to PvP in Outlaw’s Den, make sure you don’t harass people when they are just trying to get their part. In other words, if you want to kill them once, go ahead, but note who you kill and don’t kill them multiple times, so you don’t make it impossible for them to get to the vendor to get their part. In a recent developer blog on Jonathan Crow, a Game Analyst for SWTOR, there was a chart of how level 50 players spend their time in the game. Looking at this chart, it seems that more time is spent by players in Warzones than in Operations or Flashpoints, except after the addition of Terror From Beyond in 1.4, where Ops took the lead. In fact, Warzone time is almost equal to the time spent on planets, which is the leveling game and a significant portion of the time spent on the character. 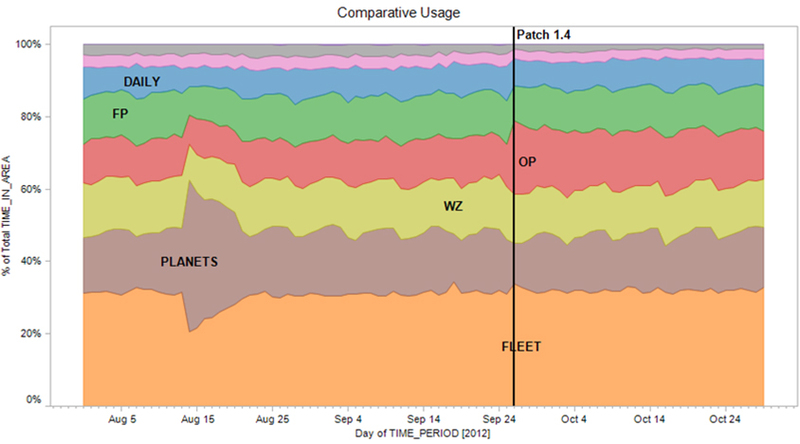 Add in the fact that a lot of the time spent in the fleet is between Warzones, and we can see that a lot of people really enjoy PvP in this game. That said, we can see where Bioware clearly needs to put its time in development. This is a little biased, as this is a PvP column, but if more people are PvP’ing than doing Operations (except right after a new Operation) AND they have had a dry spell of about 6 months with no content updates until Patch 1.6, then they must really enjoy PvP. That isn’t because there needs to be more in the other areas, because except for Flashpoints, there have been updates in all of the other areas. Even when 1.4 hit and there was a significant bump in the Operations with the addition of Terror from Beyond, the time was taken from dailies and Flashpoints, not really from PvP. This is encouraging that they realize this, and that is why, thanks to our exclusive interview with Rob Hinkle at Bioware, we now know they are thinking about a lot of different avenues for PvP, besides the regular warzones. So what do you think about these statistics, ganking, or the free respecs? Do you have any cool tips for the quickbars and the respecs? Share them below!